General cardiologist with special clinical interest in non-invasive cardiac imaging, cardiac MRI and heart failure management. 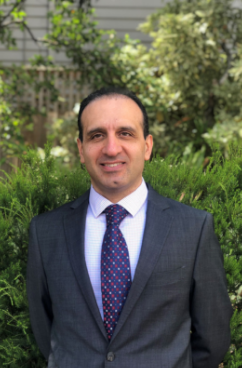 Having trained in Australia and overseas, Dr Hamid Salehi joins our expert team of Cardiologists as a General Cardiologist and Non-Invasive Cardiac Imaging specialist. Dr Hamid Salehi finished his specialist training in Cardiology in Iran before heading to the US to complete his Research Fellowship at Tufts Medical Centre. Post Fellowship, he and his family moved to Australia in September 2014, where Hamid spent a year at Barwon Health as an advanced trainee. Recently completing his appointment at the Austin Hospital in Heidelberg as a Cardiac Imaging Fellow, Hamid further trained in echocardiography, cardiac CT/MRI and in the valve and heart failure clinics. Hamid has contributed as an author for international textbooks in General Cardiology and Echocardiography and is a principal author in peer reviewed publications. Experienced in heart failure management, and highly skilled and accredited in cardiac CT and cardiac MRI, Hamid has a locum public position as a Cardiologist at the Austin Hospital. Dr Hamid Salehi is based at our Surrey Hills and Doncaster East clinics.